Sperm is the male gamete, produced in the testis of a male, while Ovum is the female gamete, produced in the ovary of a female. Ovum, also known as egg cell and is said to be the largest cell in the female body. On the contrary Sperm cells is the smallest cell in the male body. Egg cell and sperm cells differ in many ways, which can be their origin, nature, composition, and purpose for existence. Though both play an important role at the time of human reproduction process, where the participation of both the opposite gametes is equally important and necessary. The cell having the single set of unpaired chromosomes is called as gametes. Each cell (gamete) contains 23 chromosomes which further fuse to form the complete set of chromosomes (46). The process by which male and female reproductive cells are produced is called gametogenesis. The production of sperm is as Spermatogenesis and that of the female is called as oogenesis as ovums are produced. In this article, we will discuss few common difference between the both the type of the reproductive cell. Size Very small. Large in size. Movement Can move. Not able to move. Mitochondria In the middle piece, mitochondria form a spiral and are compactly arranged. Mitochondria are scattered in the cytoplasm. Cytoplasm Present in the small amount. Present in large amount. Nucleus It is condensed with no nucleoplasm. Ovum contains nucleoplasm, called as the germinal vesicle. The nucleus contains X or Y chromosome. The nucleus contains only X chromosome. Produced in Sperms are produced in the testes. Ovum is produced in ovaries. 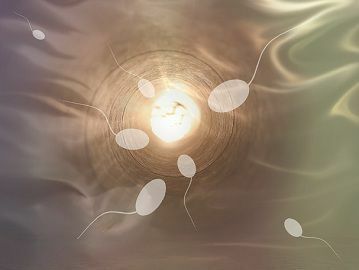 Number of sperms formed Four sperms are formed from one spermatogonium. Only one ovum is formed from one oogonium. Differentiated into Sperms are separated into head, neck, middle piece and tail. Ovum is not externally separated into regions. Surrounded by Surrounded by plasma membrane only. Ovum is surrounded by the egg envelopes. 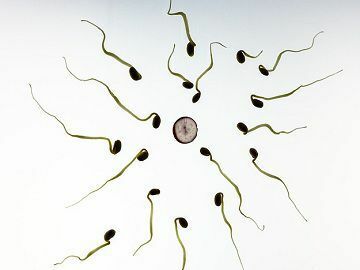 Sperm is derived from the Greek word ‘Sperma‘ which means seed. It is the male reproductive cell. Sperm is said to be the straightest and the smallest cell in the human anatomy. Sperm cells size is about 60 um long, which is motile, and flagellated. The nucleus is small, with the small quantity of cytoplasm. The cell is divided into various parts like the head, neck, middle piece and long tail with some mitochondria. In the women’s womb, sperm cells can be conserved and frozen below at 60-degree Celsius. The process by which sperms are produced is called as spermatogenesis. Ovum is the female reproductive cell. These are also known as egg cell, oocytes. Ovum is round in shape and does not require the microscope to be seen and are visible through naked eyes. As the ovum has the large amount cytoplasm, they are said to be the largest cell in the anatomy of the human. Their size varies from 0.15-0.2 mm and is surrounded by the zona pellicuda, which is the transparent, non-cellular zone. The volume of the cytoplasm is so high, that nucleus is found dissolved in it. Though these cells are non-motile. Oogenesis is the process of producing ovum. Even after so many dissimilarities between both types of cells (sperm and ovum), fuse into each other at the time of conception. In the natural flora, the egg cell can exist only for 12-24 hours and can’t be conserved. Sperm is the male gamete which is long, motile, flagellated cell and is differentiated into head, neck, middle piece and tail, though they are comparatively smaller in size. Ovum is the female gamete, where the cells are rounded spheres and non-motile, though not differentiated into different parts, and the cells are larger in comparison to the sperm cell. Mitochondria forms a spiral and are compactly arranged in the middle piece in the sperm, but in the ovum, mitochondria are scattered in the cytoplasm. Cytoplasm is present in small amount in sperm as compare to the ovum. The nucleus is condensed with no nucleoplasm and contains X or Y chromosomes in Sperms along with centrioles, while Ovum contains nucleoplasm called as germinal vesicle and contains only X chromosome, centrioles are absent. Sperms are produced in the testes, where four sperms are formed from one spermatogonium, whereas Ovum are produced in ovaries, and only one ovum is formed from one oogonium. Sperms are differentiated into head, neck, middle piece and tail, and is surrounded by the plasma membrane. Ovum is not externally differentiated into various parts and is surrounded by the egg envelopes. Difference between the two cells is prevalent. These two cells (sperm and ovum) are though significantly opposite cells regarding their origin, purpose, and nature. But these cells play their vital role at the time of conception, where the egg cell and ovum fuse to form. The zygote. It is said that there is apart from these two cells, there is no such cell which combines and fit together to form the new diploid cells.